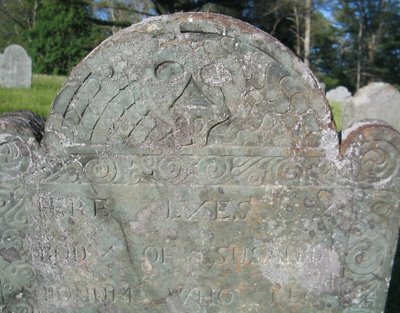 The oldest stone from Lakenham Cemetery is 1718. Although Carver is right next to Plymouth, it was not widely settled into later years of Plymouth Colony. Very marshy, it now serves as a vast harvest of cranberry bogs. Back then, its marshes were appreciated, enough so to be purchased in large plots by Plymouth families, but for the most part they kept their live-in residences within Plymouth limits. There is also a good genealogy site with some pictures from the cemetery. After trekking to the Stetson Cemetery down by the Hanson airport, I made my way down a long graveled driveway to a group of houses, set back from Route 27, near the Great Cedar Swamp. 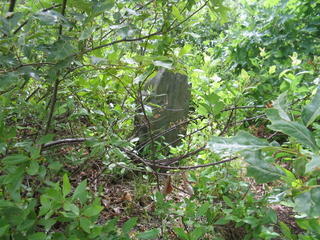 Sitting in the “front yard” of these houses rests Hanson’s oldest cemetery, the Munroe cemetery. 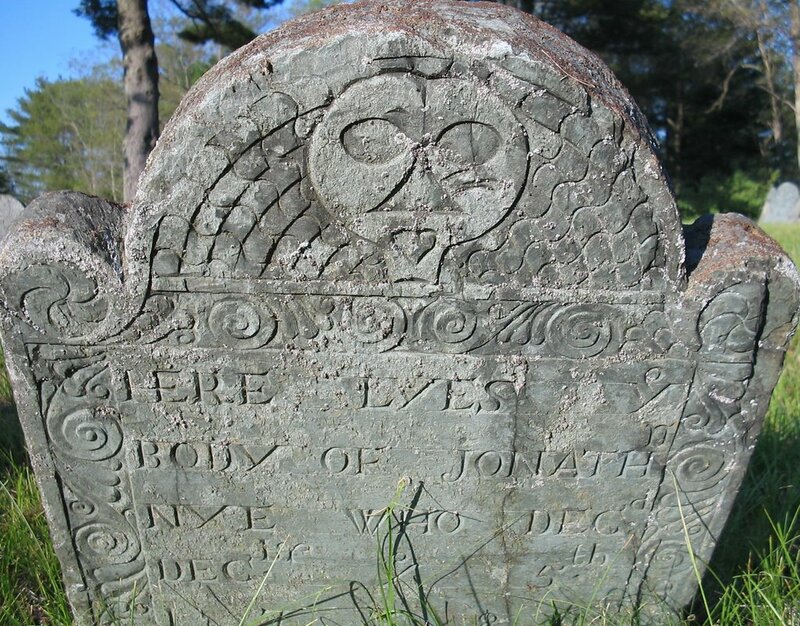 The cemetery was first made on the land of Henry Munroe Sr. for his wife Hannah, and two of his children, Bennett and Mercy, all who died in December of 1759 of smallpox. Hannah, dau. 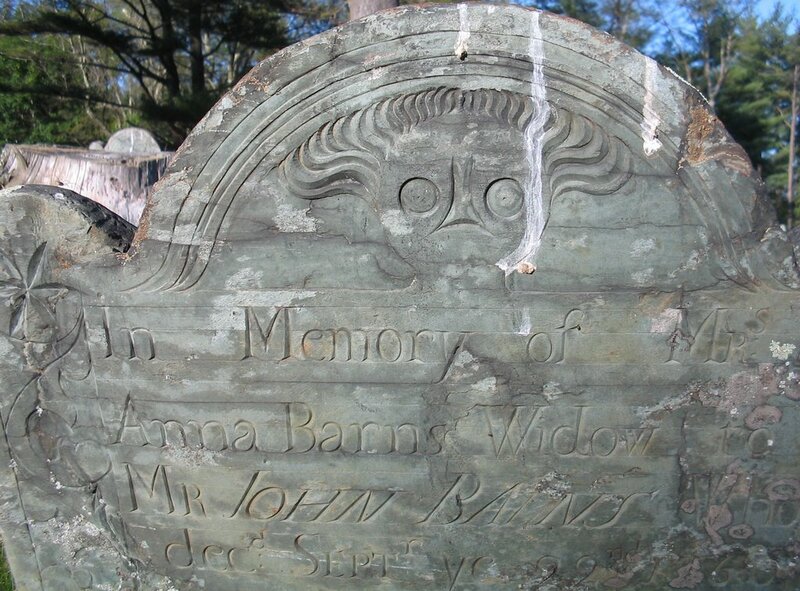 of Henry Josselyn and wife of Henry Monroe, died of Small Pox, Dec. 20, 1759, 41st yr.
Over the years the little cemetery grew to accomodate more of the Munroe family, and others connected with them. It is well preserved to this day, which is understandable considering it can be viewed quite prevalently from the homes near it (unlike the Stetson cemetery, which has been forgotten and neglected). No longer found upon modern-day maps, this forgotten cemetery on the border of Hanson, Pembroke, and Halifax had become my Holy Grail during the past year. I came upon a document from the late 1800s detailing it’s location and also found a map from 1879 which had it’s location marked. For photographs and more info, see my USGenWeb Hanson cemeteries page. Armed with lots of bug-spray and long sleeves, my mother (an avid supporter of these graveyard wanderings, one of the blesssed few to be enthusiastic about such ventures!) and I trekked down past the railroad tracks, cranberry bogs and airport, searching in hopes of stumbling across the cemetery. Eventually a piece of broken slate was spotted amongst the underbrush, and further exploration revealed a decent spread of stones, terribly overgrown, neglected – a dismal sight to see. I recorded with paper and pencil as well as camera all of the stones I could find, although I know for certain that there are a number of stones which I missed – either lost in the brush or stolen along the years. And soon you’ll be with me.